An oil spill spells disaster for all involved. Ship owners, the ship’s crew, salvors, the coast guard, emergency responders, oil companies, insurance brokers and last but not least, our precious environment. The irreversible damage spreads like ‘oil on water’. Now we have introduced the problem, let us introduce the solution, the Sea Trophy. The Sea Trophy is the first complete mobile pump system that enables the controlled, contained, fast (fuel-) oil recovery after incorrect or off-spec fuelling and in the event of grounding or calamity at sea. The Sea Trophy is inserted, along with an inner pipe seal, into the piping system of the vessel or as a standalone solution with a Milk can. Result: the contained, controlled transfer of the fuel to the required collection point without polluting the environment. 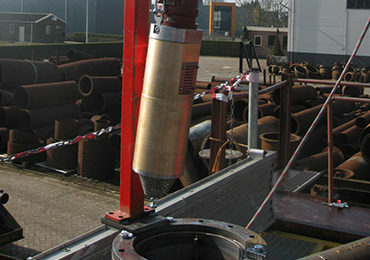 The Sea Trophy is a hydraulically driven submersible screw spindle pump. The pump has a unique, patented three spindle configuration. A compact pump with an impressive capacity of 70 m³/hour. With its manageable 55kg the pump can be inserted into pipes, or through access holes as small as Ø200mm.